The airflow resistance provided by the airways during breathing is essential for good pulmonary function. The nose is responsible for almost two thirds of this resistance. Most of this resistance occurs in the anterior part of the nose. This region is called the nasal valve, and it acts as a flow-limiter. The nasal valve was originally described by Mink in 1903. It is divided into external and internal portions. The external nasal valve is formed by the columella, the nasal floor, and the nasal rim (or caudal border of the lower lateral cartilage). The nasalis muscle dilates this portion during inspiration. The internal nasal valve accounts for the larger part of the nasal resistance. It is located in the area of transition between the skin and respiratory epithelium, and it is usually the narrowest part of the nose. The internal nasal valve is the better-known valve and is often referred to as the nasal valve. The 2 terms should be differentiated because the nasal valve accounts only for the aperture between the nasal septum and the caudal border of the upper lateral cartilage (ULC). The angle formed between them is normally 10-15° in white patients. This measure was believed for many years to be universal. However, in 2006, Miman et al found the angle to be 22.5-52º in Turkish patients without nasal obstruction symptoms or septal deviation. These measurements where made with nasal endoscopy in living subjects. The nasal valve area (as in the image below) is formed by the nasal septum, the caudal border of the ULC, the head of the inferior turbinate, and the pyriform aperture and the tissues that surround it. This area is responsible for more than two thirds of the resistance produced by the nose. Rhinoplasty for internal valve stenosis. Normal internal nasal valve anatomy. Notice the relationship between the septum, upper lateral cartilage, pyriform aperture, and inferior turbinate. In 1894, Franke performed nasal-flow experiments in models and cadavers and found that whirl formation occurred near the head of the turbinate during calm breathing. The term nasal valve was first coined by Mink in 1903. He developed this concept further in 1920, suggesting that the greatest area of resistance was in the limen nasi or the union of the lobular cartilage and ULCs. In 1940, Uddstromer found that 70% of the resistance of the nose was produced in the nasal valve area and the remaining 30% was due to the nasal fossa. Van Dishoeck further investigated the mechanisms of the nasal valve in 1942, and in 1970, Bridger and Proctor wrote about a "flow-limiting segment" that included the limen nasi and the pyriform aperture. In 1972, Bachman and Legler found the pyriform aperture to have the smallest cross-sectional area of the nasal airway. As many as 13% of the patients with chronic nasal obstruction have nasal valve collapse. Of these patients, 88% have unilateral collapse. External nasal valve collapse can be found in patients without a history of trauma or surgery. These patients commonly have an overprojecting nose with extremely narrow nostrils. Another cause, though uncommon, can be an extremely wide columella, as seen in the image below. Rhinoplasty for internal valve stenosis. External nasal valve stenosis. The nasal rim is collapsed because of an extremely thick columella. Rhinoplasty for internal valve stenosis. Internal nasal valve stenosis. Notice the collapse of the area between the septum and the left upper lateral cartilage. Also notice the decrease of cross-dimensional area due to the deviated anterior septum. Deviations of the caudal septum are the most common cause of valvular collapse. They are usually secondary to trauma. The septum can be overly thick in the valvular area, decreasing the space in it. Also, an absence of cartilage in this area leaves a flaccid septum that moves during inspiration. Thickened cartilage can compromise an adequate aperture. The cartilage can also be twisted, deflected, or associated with excessive return of the caudal border. An absence of cartilage, either congenital or iatrogenic, can produce a flaccid valve that collapses during inspiration. Overresection during rhinoplasty can weaken the cartilage and cause inspiratory collapse. Deformation of the cartilage can be a result of trauma or congenital malformations of the cartilage. Also, scarring due to surgery can produce the lateral crura to obstruct the nasal valve, as shown below. Trauma or previous surgery can create webs or stenosis in the valvular area. The tissue can also be too thick, reducing the lumen of the valve. This can be a result of inflammation or hypertrophy. Minman et al describe the presence of a septal body in the valvular area. Benign tissue similar to the turbinates, it can produce stenosis of the nasal valve if the nasal cycle is in the congestive stage. Hypertrophy of the inferior turbinate can significantly increase nasal resistance. Several studies have demonstrated that the head of the turbinate is responsible for most of this increase. 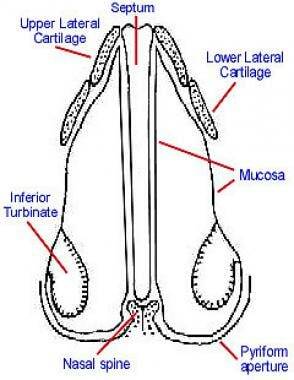 In comparison, the body and tail of the turbinate play minor roles in nasal resistance. The increase in size can be secondary only to mucosa or bone hypertrophy. Although uncommon, some patients may have deformities of the pyriform aperture that reduce the space of the nasal valve. The first description the authors found of a congenital stenosis of the pyriform aperture was made by Brown et al in 1989;  other reports have followed, such as Ramadan, 1995; Fornelli, 2000;  and Lee, 2002. A more common cause of obstruction is the osteotomy made during a rhinoplasty. In particular, the type known as low-to-low is blamed for excessive narrowing of the pyriform aperture. Some modifications to this procedure allow an osteotomy to be performed without compromising the space in the valve. Rhinoplastic procedures are particularly prone to disturbing the nasal valve area. Hump removal affects the nasal valve in several ways. If the hump is particularly large, separation of the ULC can be necessary. Resection of the T-shaped area of the dorsal border of the septum produces a narrower area in the roof. If the mucosa in the valve is not protected during the surgery, which occurred with the use of many older techniques, scarring of the valve can lead to structure formation or stenosis of the valve. In reduction rhinoplasties, the cross-sectional area of the overall nose is reduced. This increases the resistance to airflow. If the nasal valve is not properly repaired during the surgery, patients may report nasal obstruction after the surgery, even if this was not reported preoperatively. Overresection of the lower lateral cartilage can lead to pinching and inspiratory collapse. Age is another factor to consider. The relaxation of tissues may eventually produce a flaccid valve. In these cases, surgery of the valve can correct the loss of patency. The internal nasal valve works as a flow-limiting area. The fixed part of the valve is composed of the septum and the pyriform aperture. The ULC and the mucosa of the turbinate act as the mobile part. When air is inspired, it is forced through this narrow area, increasing its speed and pressure. Just after passing the valve, the air expands in the bony cavum, creating turbulence that promotes contact between the air and the mucosa. In this way, the inspired air is cleansed of particles, humidified, and heated or cooled (depending on its temperature). Because it is the narrowest part of the nose, the nasal valve can be affected by minute alterations of the nasal anatomy that would not be important in other areas. The angle between the ULC and the nasal septum is 10-52°. Internal nasal valve collapse occurs when, for some reason, this angle is diminished. The result is an increase in nasal resistance to airflow; consequently, the patient reports nasal obstruction. The opposite is known as ballooning. In this case, the nasal valve is excessively open. The increase in nasal resistance is also related to abnormalities of pulmonary function. These changes in pulmonary function return to normal after septal surgery is performed and nasal resistance is decreased. Patients primarily report nasal obstruction. Other symptoms are crusting and bleeding, but these are more often associated with septal deviation. Diagnosis can be difficult if the physician does not visualize the valvular area. Examining the valve without disturbing it with a nasal speculum is important because the speculum usually opens the valve. Sometimes, trimming the vibrissae is necessary to obtain a clearer view of the valve. Another method is to use a 0° endoscope. The Cottle test is useful to evaluate nasal valve stenosis. The cheek of the evaluated side is gently pulled laterally with 1-2 fingers, which opens the valve. The examiner then asks the patient to breathe and evaluates if breathing is better before or after pulling the cheek. A positive test result is when the patient feels less resistance with the valve opened. This test is easy and quick to perform (see the image below). The Cottle test is useful to evaluate nasal valve stenosis. The cheek of the evaluated side is gently pulled laterally with 1 or 2 fingers, which opens the valve. The internal nasal valve is limited medially by the nasal septum. Laterally, in its superior part, it is limited by the caudal border of the ULC, where it forms the limen nasi with the cephalic border of the lobular cartilage. 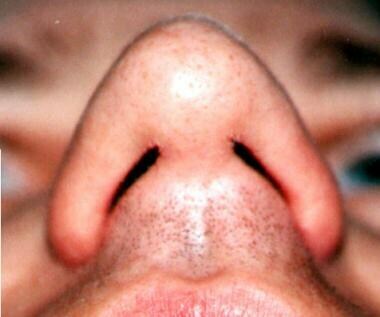 The angle between the septum and the ULC is 10-15° in the noses of white persons. Persons of other races demonstrate great variability in this nose measurement, as previously mentioned (22.5-52º). In this area, epithelium shifts from the skin of the vestibule to the respiratory mucosa of the bony cavum. The pyriform aperture continues the limit of the valve from the ULC to the floor. 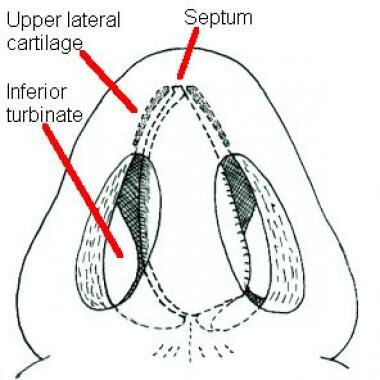 The head of the inferior turbinate is immediately posterior to the pyriform aperture and plays an important role in the function of the valve, which is the reason it is also considered part of the internal nasal valve (see the image below). In some patients, particularly white persons, the caudal border of the ULC scrolls externally in what is called the returning of the ULC. When this returning is excessive, it can produce valve collapse. Miman MC, Deliktas H, Ozturan O, Toplu Y, Akarcay M. Internal nasal valve: revisited with objective facts. Otolaryngol Head Neck Surg. 2006 Jan. 134(1):41-7. [Medline]. Franke G. Experimentille Untersuchen Luftdruck, Luftbewegung un Luftwiechsel in der Nase und ihren Nebenh?. Arch F Laryngol 1894; 1(230) on Functional Corrective Surgery of the Nasal Septum. Mentioned by Cottle MH in Excerpts from the XI International Postgraduate Course. 1974. Mink PJ. Le nez comme voie respiratorie. Presse Otolaryngol. Belgium: 1903. 481-96. Haight JS, Cole P. The site and function of the nasal valve. Laryngoscope. 1983 Jan. 93(1):49-55. [Medline]. Constantian MB. Differing characteristics in 100 consecutive secondary rhinoplasty patients following closed versus open surgical approaches. Plast Reconstr Surg. 2002 May. 109(6):2097-111. [Medline]. Brown OE, Myer CM 3rd, Manning SC. Congenital nasal pyriform aperture stenosis. Laryngoscope. 1989 Jan. 99(1):86-91. [Medline]. Fornelli RA, Ramadan HH. Congenital nasal pyriform aperture stenosis: clinical review. Otolaryngol Head Neck Surg. 2000 Jan. 122(1):113-4. [Medline]. Lee KS, Yang CC, Huang JK, Chen YC, Chang KC. Congenital pyriform aperture stenosis: surgery and evaluation with three-dimensional computed tomography. Laryngoscope. 2002 May. 112(5):918-21. [Medline]. Samaha M, Rassouli A. Spreader graft placement in endonasal rhinoplasty: technique and a review of 100 cases. Plast Surg (Oakv). 2015 Winter. 23 (4):252-4. [Medline]. Talmadge J, High R, Heckman WW. Comparative Outcomes in Functional Rhinoplasty With Open vs Endonasal Spreader Graft Placement. Ann Plast Surg. 2018 May. 80 (5):468-71. [Medline]. Friedman O, Cook TA. Conchal cartilage butterfly graft in primary functional rhinoplasty. Laryngoscope. 2009 Feb. 119(2):255-62. [Medline]. Brandon BM, Austin GK, Fleischman G, et al. Comparison of Airflow Between Spreader Grafts and Butterfly Grafts Using Computational Flow Dynamics in a Cadaveric Model. JAMA Facial Plast Surg. 2018 May 1. 20 (3):215-21. [Medline]. Ozturan O, Miman MC, Kizilay A. Bending of the upper lateral cartilages for nasal valve collapse. Arch Facial Plast Surg. 2002 Oct-Dec. 4(4):258-61. [Medline]. Lee DS, Glasgold AI. Correction of nasal valve stenosis with lateral suture suspension. Arch Facial Plast Surg. 2001 Oct-Dec. 3(4):237-40. [Medline]. Lee SD, Glasgold AI. Correction of nasal valve stenosis with Lateral Suture Suspension. Arch Facial Plast Surg. 2001. 3:237-240. O'Halloran LR. The lateral crural J-flap repair of nasal valve collapse. Otolaryngol Head Neck Surg. 2003 May. 128(5):640-9. [Medline]. Buyuklu F, Cakmak O, Hizal E, Donmez FY. Outfracture of the Inferior Turbinate: A Computed Tomography Study. Plast Reconstr Surg. 2009 Mar 23. [Medline]. Seren E. A new surgical method of dynamic nasal valve collapse. Arch Otolaryngol Head Neck Surg. 2009 Oct. 135(10):1010-4. [Medline]. Chung V, Lee AS, Scott AR. Pediatric nasal valve surgery: short-term outcomes and complications. Int J Pediatr Otorhinolaryngol. 2014 Oct. 78 (10):1605-10. [Medline]. Rhinoplasty for internal valve stenosis. Septal causes of valvular stenosis, from left to right, are (1) a thickened septum, (2) deflection of the septum, and (3) caudal deviation with an inferior spur. Rhinoplasty for internal valve stenosis. Upper lateral cartilage (ULC) causes of valvular stenosis, from left to right, are (1) excessive returning, (2) thickened ULC, (3) twisted ULC, and (4) deflected ULC. Rhinoplasty for internal valve stenosis. Mucocutaneous causes of valvular stenosis, from left to right, are (1) synechia, (2) stricture, and (3) edema of mucosa. Rhinoplasty for internal valve stenosis. Iatrogenic causes of valvular stenosis. Absence or excessive trimming of the ULC. Coronal view shows a contact area between the right nasal wall and the septum. Normal valvular area in an axial view.